Fantastic news for fans of Fred. New owners Leon and Jan have opened up Fred's home and workshop as a heritage centre. Please visit freddibnahheritagecentre.co.uk and show your support. Britain's number one magazine for steam and industrial heritage, often with articles featuring Fred. Ho Fred, Ho Fred, Ho Fred - An original tune by Alan Walton. Sounds very much like Fred! Fantastic song by Steve and his mate about Fred. Very catchy tune that has gone down well with fans. This brand new MagBook from Dennis Publishing brings to life the extraordinary memory of our favourite steam fanatic, Fred Dibnah! Spanning 132-page and written in Fred's own unique words, this MagBook presents a fascinating insight into Fred's love for the world of steam, his home life, and of course, rise to fame as a television personality. The MagBook also delves into the extensive Dibnah archive to reveal fascinating documents as well as never before seen images. Following Fred's untimely death, Keith Langston embarked upon the creation of a book, drawing not only on his experiences with the Bolton born steeplejack and TV presenter, but in addition talking to a representative cross section of those persons who numbered themselves amongst Fred's many Friends. With over 300 unique colour photographs, this book is a must have for all Fred Dibnah fans. The magbook provides compelling features, never before seen photos, documents and a unique insight into Fred's fascinating early career. 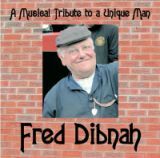 A must for any Fred Dibnah fan is this new 132 page magbook with FREE audio CD of Fred on tour. Available from WHSmith High St, online at amazon.co.uk and magbooks.com. Super song by Alan Walton. Very catchy tune and a fitting tribute to Fred. Listen to it all for Alan's tale at the end, he sounds just like Fred. Another song by Alan Walton on YouTube. Recorded on a mobile phone, Alan's latest recording and yes, he still sounds like Fred! Fred Dibnah, one of Bolton's best loved sons, steam enthusiast, world famous steeplejack and TV personality was born in Bolton in 1938. Why have Fred on a Wigan website then? Because I am a massive fan and Fred lives only 20 miles away from me in neighbouring town Bolton. I am indebted to Tony Haslam for setting up the meeting with Fred. Tony is a good friend of Fred and is assisting with the safety aspects of Fred's latest project, the sinking of a coal mine. Since the initial visit in March I have been lucky enough to visit Fred most weekends. I was going to write a paragraph or two about Fred, and his work but decided against it. Everyone knows about Fred, his career as a steeplejack and his numerous programmes that have appeared on television. If you would like to know more about Fred, visit the sites listed on the links page. Most of the photos on this site have been taken by Tony Haslam, John Haslam and myself. Photos sent in by others include their name with each pic. If you have some photos of Fred you would like to share, then please email them to me along with a short description, date (or approx) and your name. Raising money for Fred's Memorial Fund. Pencil drawing of Fred, by Richard Hagan.